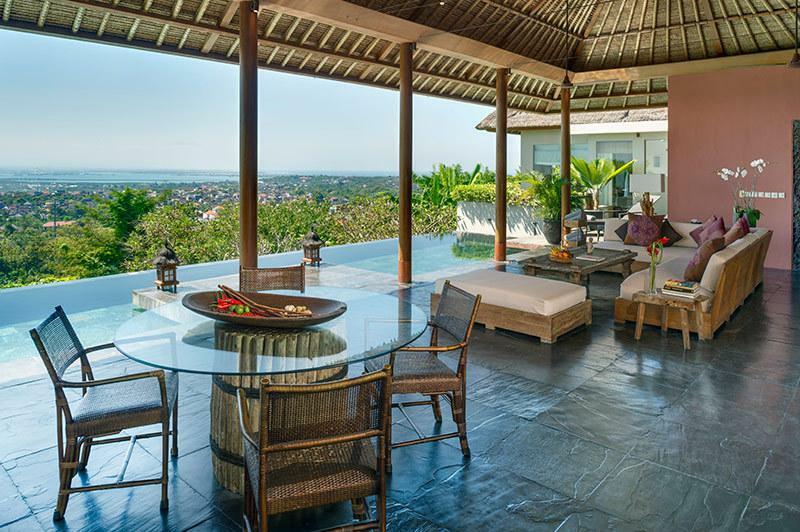 With sensational views from its hilltop position in Jimbaran, outstanding architectural design, evocative Indonesian antiques and gourmet cuisine, the villa provides a true feast for the senses. 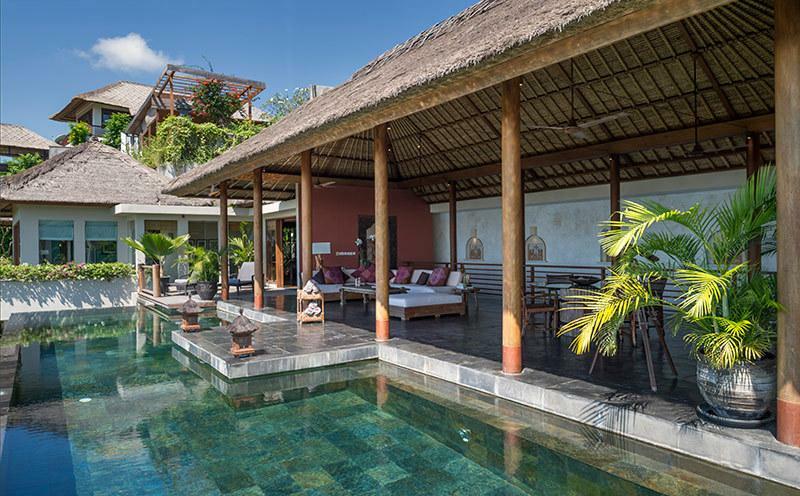 Rich in sumptuous detail, and boasting an infinity pool, enchanting terraced gardens and six private bedrooms – each uniquely themed to a different region of Indonesia – the villa is ideal for groups, extended families and intimate weddings. 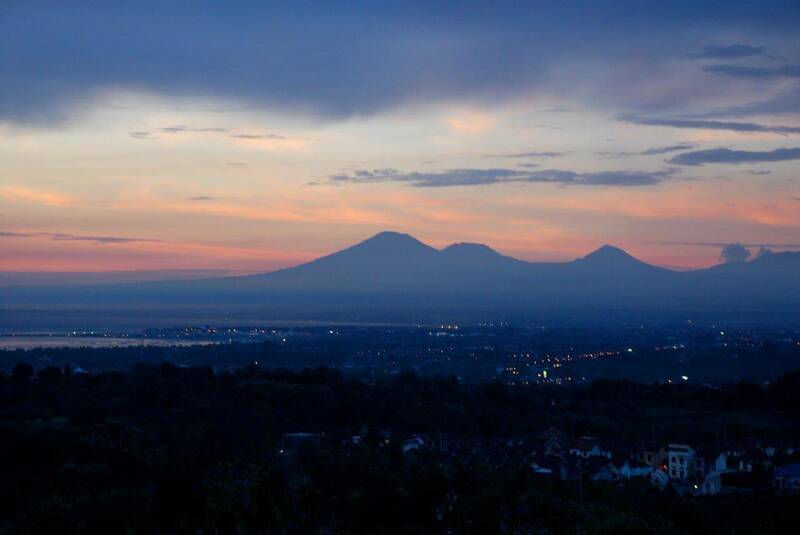 A team of experienced staff provide the warmest of welcomes and a complimentary car and driver is available to whisk you to Jimbaran’s tranquil bay, the revered cliff-top temple of Uluwatu, or the world famous surf beaches of the Bukit Peninsula. The 180-degree coastal panorama from the villa will take your breath away. 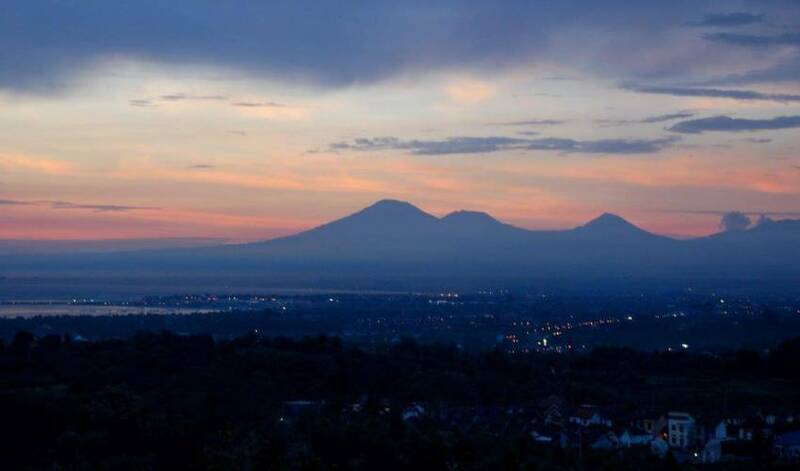 The narrow isthmus that separates The Bukit Peninsula from the rest of Bali is clearly visible over the treetops and a chain of majestic volcanoes loom in the distance. At night, the view of the island’s southern plains ablaze with twinkling lights is equally spectacular. 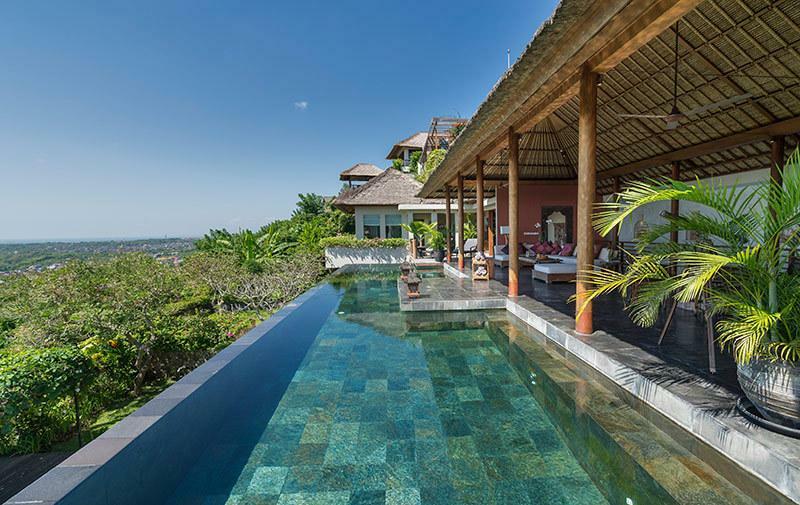 Designed by renowned Balinese architect, Popo Danes, the villa is a three-storey masterpiece of contemporary tropical design. 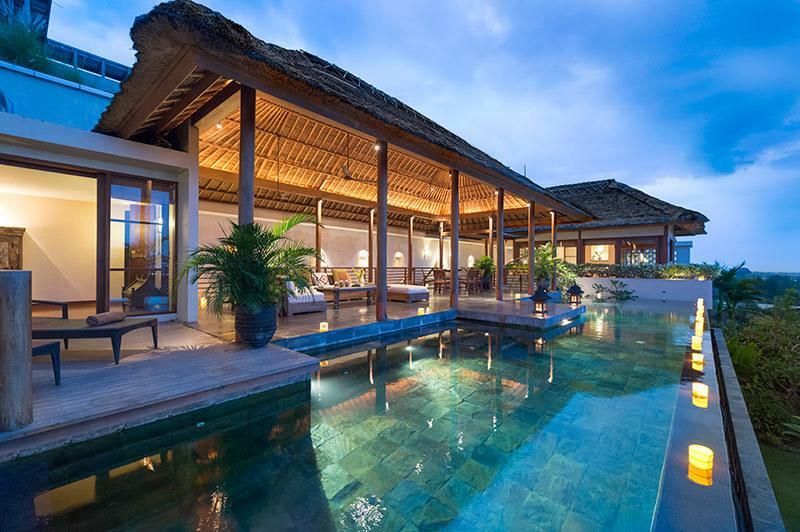 Integrating the natural contours of the land this spacious villa is an intriguing maze of thatched roofs, lush gardens and cascading water features. Evocative interiors reflect the owners’ love of their adopted island home, with hand-picked textiles, furnishings and antiques collected during extensive travels across the Indonesian archipelago. 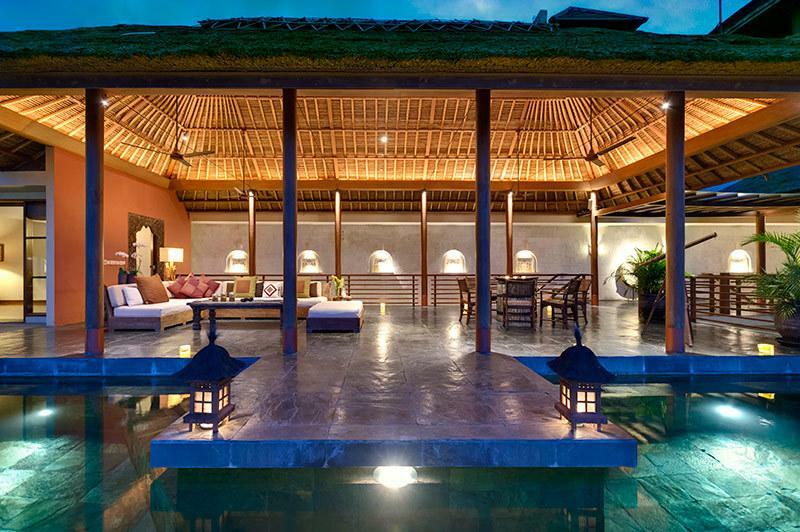 The atmospheric living room on the upper floor melds seamlessly with the infinity pool just beyond, and the villa’s six generous bedrooms are each imbued with their own unique Indonesian flavour. The villa’s long narrow design affords similar stunning views from every room and this, combined with a delightful garden, convivial dining room, air-conditioned gym, spa room and home theatre, makes the place a perfect holiday retreat. 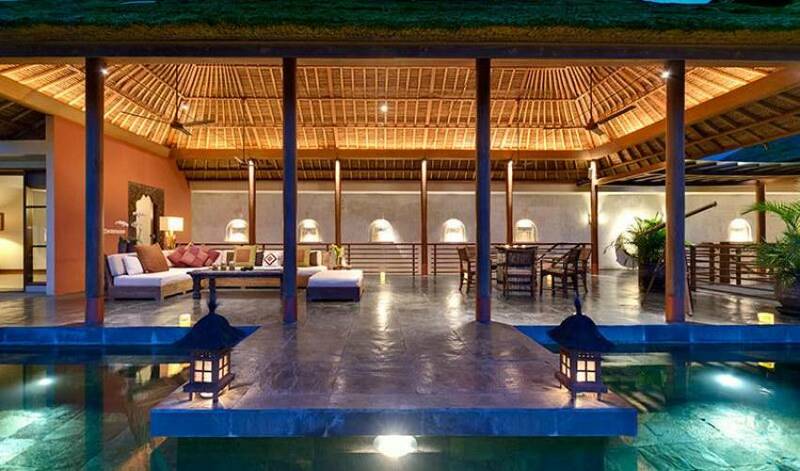 From the moment you arrive you will be lavished with the warm hospitality that the Balinese are so famous for. The experienced, staff team includes two talented chefs, equally adept at whipping up Italian, Asian, Moroccan and Balinese feasts from a suggestion menu (on guest account) or grilling up a seafood barbecue. 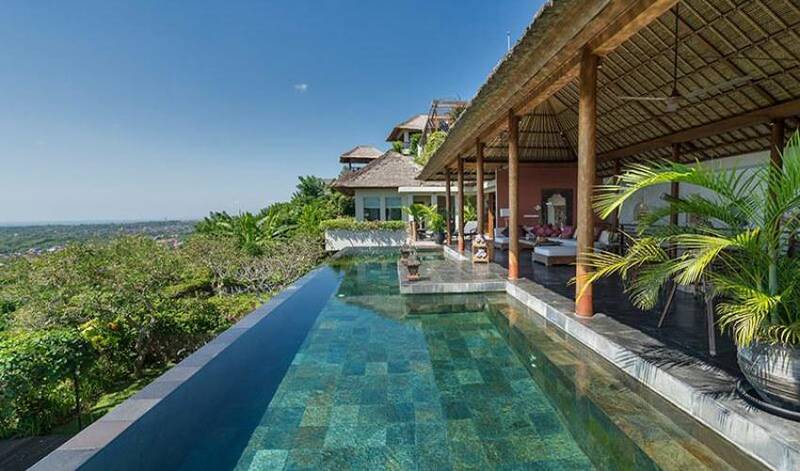 In-villa activities include the art of Balinese flower offerings, private yoga classes and decadent spa packages, while a complimentary car and driver is on hand for those who wish to explore the rugged beauty of the Bukit Peninsula and beyond. The villa extends over three floors, each connected by a lift to the ground floor parking area. On the upper floor are the living and dining rooms, kitchen, master bedroom and swimming pool. Below are three guest bedrooms and the home cinema, plus, at a slightly lower level, two twin bedrooms separated by a sitting area that opens to the garden. Lower still, the villa’s mezzanine level is home to a spa room, gym, kids’ play area and the staff quarters. 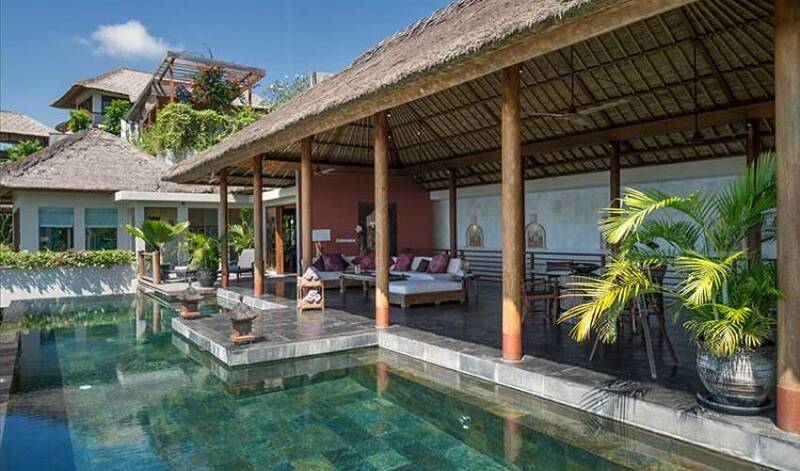 Carved into the wall of pale local stone that forms the villa’s backbone, little alcoves display statues and paintings evoking the epic story of the Ramayana, and passageways dotted with intimate seating areas and open stairways link spaces together. Colourful plants fringe the thatched pavilions that form the villa’s living and dining areas. Beneath the softly whirring fans of the open-fronted lounge, plump-cushioned sofas make a comfortable vantage point for soaking up the views (binoculars are thoughtfully provided for those who want to zoom in on the action) and a circular six-seater table is positioned for informal dining or game-playing. The adjoining dining room is bright and cheerful with fold-back glass doors creating a semi-outdoor dining experience as they welcome in a gentle breeze. An enormous solid saurwood table seats 12 and a pre-loaded iPod provides music to dine by. The villa’s state-of-the-art, air-conditioned home cinema is equipped with a 52-inch TV screen, DVD player and surround-sound system, and furnished with a huge lounge suite and plenty of ottomans. After enjoying a delicious dinner prepared by the villa’s talented chefs, what better than to retire to the cinema, put your feet up and be entertained in complete comfort. On villa’s mezzanine level is an air-conditioned gym equipped with a treadmill, Swiss Pilates balls and yoga mats. Also on this floor is a children’s play area furnished with a massive daybed and equipped with a dolls’ house, books, train set and games to keep younger guests happy, and the spa room with its twin massage beds and outdoor bathtub. Stretching the length of the lounge on the upper floor of the villa, the stone-tiled, 12 x 4 metre infinity pool offers spectacular views from its cooling waters, and a corner sun deck is topped with twin sun loungers. The villa’s terraced gardens are a delightful mix of lawns and flourishing foliage, where daybeds and a beautiful pergola draped with flowering vines provide plenty of quiet spots for holiday relaxation. Each of the six air-conditioned bedrooms is inspired by an island or region of Indonesia, and ornamented with unique textiles, artefacts and antique jewellery. All have private outdoor areas (either garden or terrace) and extensive views. Features common to all rooms include flat-screen 26-inch satellite TVs, walk-in wardrobes and ensuite bathrooms with large rain showers. 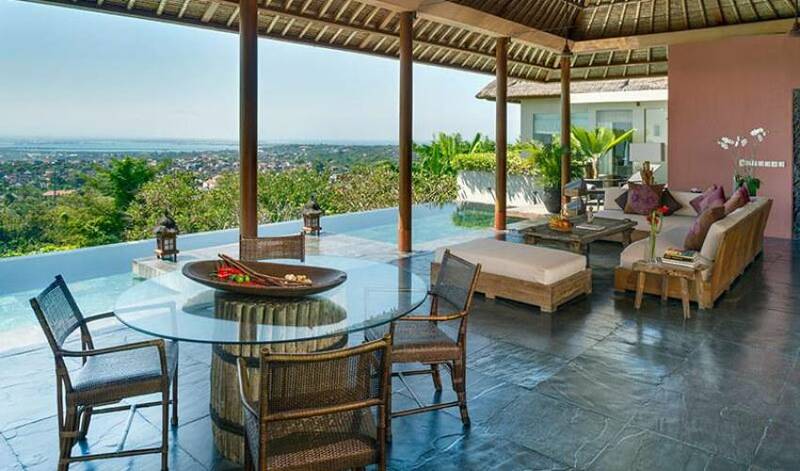 At the entrance to the Bali master suite, magnificent carved wooden doors open onto a generous study/sitting room. 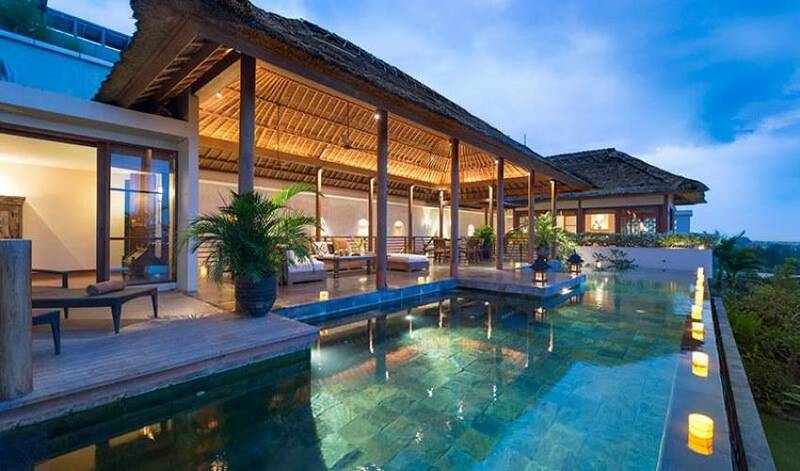 Beyond, the bedroom is furnished with a bamboo, king-size four-poster bed, and embellished with Balinese objects d’art. Glass doors fold back to a plunge pool and balcony with views matched by those from the large tub in the adjacent ensuite bathroom. In a private garden beyond the bathroom is a cascading waterfall and outdoor shower. Located just below the Bali master suite, the spacious Lombok bedroom is surrounded by fishponds and a frangipani-filled courtyard garden. The four-poster king bed is accented with olive green hand woven brocade and the room is furnished with antique wood pieces. A tub overlooks a thicket of heliconia and glass doors open onto the gardens and a cushioned day bed. The cosy Sumba bedroom is circled by a private veranda. A rustic dark wood four-poster bed is draped in mosquito netting and colourful hand woven Sumbanese ikat and furnishings include a beautiful wood-carved love seat. The bathroom has a lustrous sheen thanks to creamy-hued onyx floor tiles and hand basins, and a mirror framed in glistening onyx tiles. This large room evokes the Sumatran jungle, with soothing green décor and a sturdy king-sized bed adorned with silk brocade woven with gold thread. Elephants are embroidered onto cushions topping a sofa that converts to a single bed . The opulent bathroom has gleaming black stone walls and a copper basin. Outside, on a timber deck, is a bathtub carved from river rock, fringed by a bamboo fence, lush foliage and dangling lanterns. On one site of a sitting area that opens onto to the garden, this twin room (convertible to king) is identical in size to West Java, but vary in décor. Colour-themed in earthy browns, East Java features a beautiful carved wall panel originally made to hold one of Java’s most revered ceremonial objects – the kris knife. A glass sliding door opens onto the garden. Across the sitting area, West Java, also a twin room (convertible to king) is identical in size to East Java. Blue batik fabric covers the beds in this room, which is decorated with antique Wayang puppets, a colonial-style wrought iron lamp and fabulous batik prints in the bathroom. A glass sliding door opens onto the garden as well. The white sandy beach and calm waters of Jimbaran Bay are only a short downhill drive from The Longhouse. Safe, shallow swimming and excellent roadside seafood stalls (only open in the evenings) are what this popular stretch of Bali coastline is famed for. South of the villa, surrounding the ruggedly beautiful Bukit Peninsula, soaring limestone cliffs descend to scenic coves pounded by some of the best surf breaks in the world. 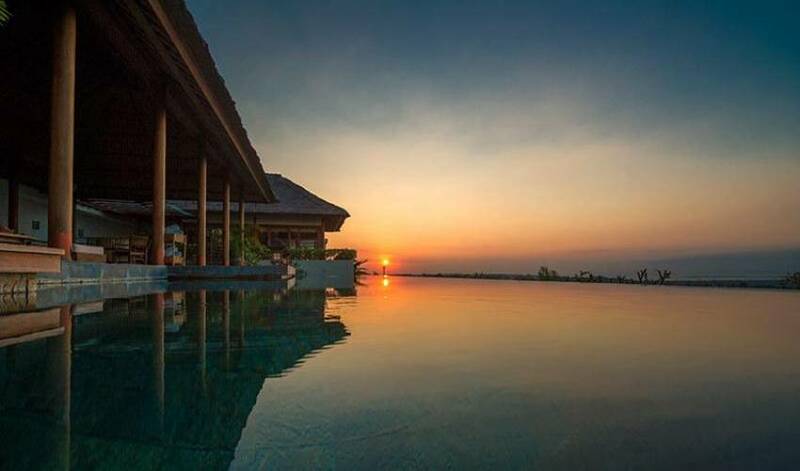 At sunset, enjoy a cultural dance performance at the famed sea temple of Uluwatu, followed by a cocktail at one of the several exclusive resort hotels that line this most southerly coast of Bali, before heading back to your even more exclusive villa.